Kindergarten Puppy Training - requires that puppy's be under six months of age. My kindergarten puppy training program is a one hour, once weekly, five session course that begins with a lecture ( no dogs) followed by four rudimentary obedience training sessions. This course utilizes positive reinforcement as the motivation for learning the exercises. A minimum of three and maximum of six puppy's make up a kindergarten group. Classes are held at my training facility. ​​Lectures are for parents, no puppy's in attendance. All puppy's and dog's being considered for group classes must be up to date on vaccinations as well as have a social and friendly demeanor. Unfortunately, we can not be responsible for missed classes. ​Please call in case of inclement weather as class may be postponed. You may use the contact page to contact Steve for more information. Note: Return telephone calls may take a couple of days due to my schedule. If for any reason, I have failed to return your call, please re-send your request as media has failed me in the past. Multiple classes will be added as the demand grows for group programs. Many thanks for your inquiry, looking forward to working with you in the near future. Monday, March 11th , Advanced Animal Handling class, Mercy College, Vet Tech program. Below is a list of previous events. Check back here soon for upcoming events. ​​On camera shoot with Bill Stanton for "The Daily Mail" Topic - How to respond to a dog attack! SPCA Top Hat & Tails Event. Meet Steve at the SPCA walk-a-thon to answer pet training questions for attendees. "Still Looking for the One Solution to Aggression Problems? Or is There Really Such a Thing?" Live Webinar with Steve Diller. Steve donated one of his puppies to the Greenburgh police department. He was named Metro. Ask Steve questions at the at the "Ask The Expert" booth while attending the SPCA's annual Top Hat and Tails event. SPCA Top Hat and Tails Fund Raiser. Friday, October 21st at the Ritz, Ask the Trainer. Round Table Discussion for the Dog Trainers Conneection "The Way You Do TheThings You Do"
Pet Goods appearance. 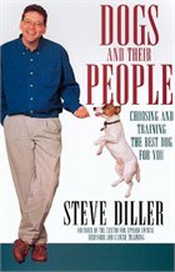 Get your behavior related questions answered by Steve Diller at the Scarsdale Pet Goods location from 12 noon to 3pm. Dog Trainers' Connection Presents "A Dog Trainer Round Table". New York, NY. Steve was feautred as the Expert speaker at a fundraiser for "Dogs in Danger". SPCA Walk-A-Thon. Saturday, April 30th at Roosevelt State Park. DOGS IN DANGER Walk and Fund Raiser. Sunday, May 15th at Roosevelt State Park. If you would like Steve to appear at your next event, fill out the contact form below.